Seeking a little more grunt and growl from your V8-equipped 2015 Ford Mustang GT? Corsa Performance is here to help, now offering two new exhaust kits specially-developed for America’s premier pony car. 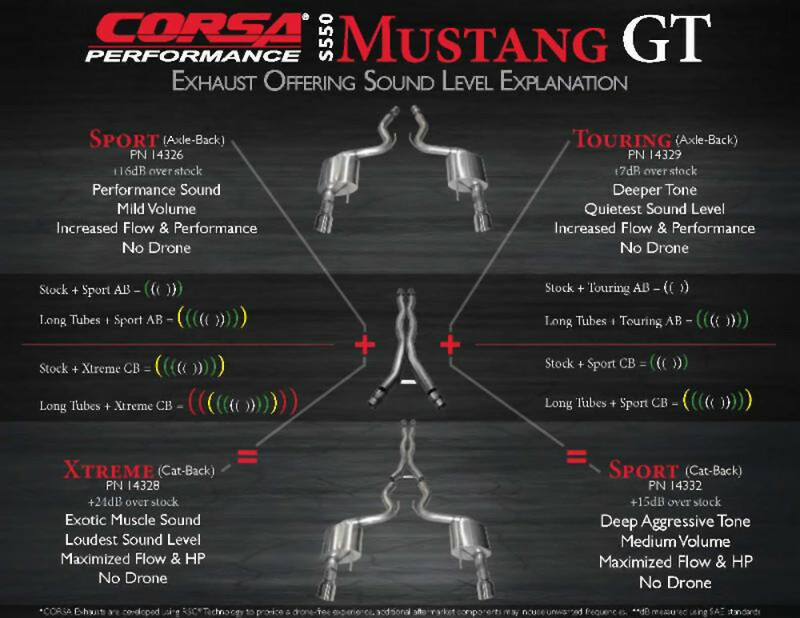 Corsa Performance‘s new Ford Mustang GT exhaust is now available as either an axle-back “Touring” kit, or a catalyst-back “Sport” kit (video above). Each features smooth, non-turbulent mandrel bends, 3-inch diameter pipes, and dual mufflers with single 4.5-inch tips. According to the manufacturer, exhaust gas flow has been improved by 45.99 percent in the former configuration, and 48.35 percent in the latter, meaning optimized system back pressure and increased horsepower. The cat-back Sport kit also promises a 7-pound weight-reduction versus the stock 2015 Mustang GT exhaust. But of course, performance is only half of the appeal of an aftermarket exhaust setup; the other is sound. On that note (pun most-definitely intended), Corsa’s new Touring axle-back kit for the Mustang GT promises a deeper tone with no drone, and a marginally increased volume, while the new cat-back Sport kit is being marketed as something a tad less-civilized. It represents a nice middle-ground between the gentlemanly Touring collection of components, and Corsa’s previously-existing “Xtreme” cat-back exhaust kit. Pricing for these two new kits is not yet available. I’m reading fordauthority.com and I came up with the idea how it can earn additional $50/day.